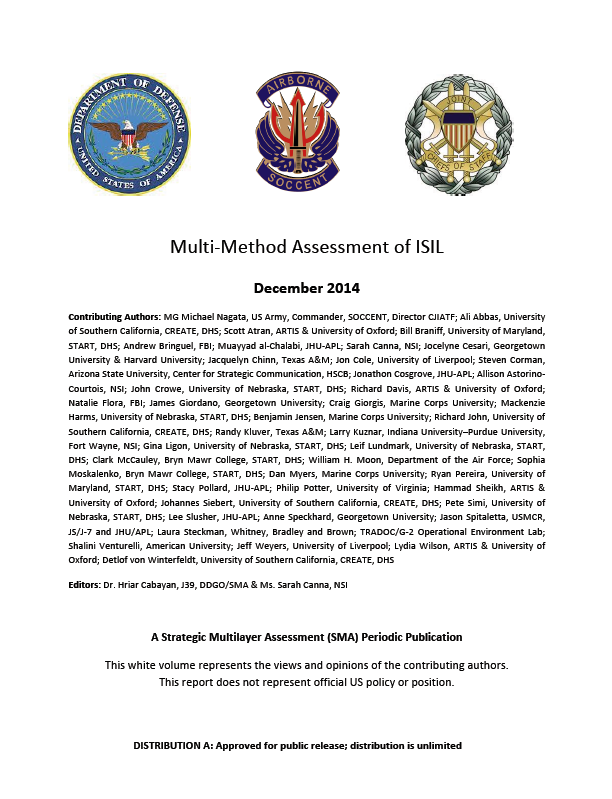 The following multi-method assessment of the Islamic State of Iraq and the Levant (ISIL) was commissioned in the summer of 2014 by MG Michael Nagata, Commander, SOCCENT and written by “an unofficial brain trust outside the traditional realms of expertise within the Pentagon, State Department and intelligence agencies” in an effort to understand the psychology of ISIL and its supporters. The assessment was the subject of an article by the New York Times’ Eric Schmitt in late December 2014. A “Subject Matter Expert Elicitation Summary” of the assessment from January 2015 is also available. In accordance with the age old dictum that, “before one can solve a problem, one must first seek to understand it,” I would argue that we in the West, and indeed most who were not born and raised within the Islamic world, have struggled to meet the test of the second part of that adage. As a veteran of Special Operations and Counter-Terrorism activities against Violent Extremism, this weakness in our comprehension has been a source of constant worry for myself and my colleagues. Too often, it has hindered my own efforts to plan operations, anticipate events, predict outcomes, or evaluate risks. While I would certainly argue that we have achieved some important successes over the years, honesty requires me to acknowledge that I have never been able to achieve all that I had hoped for. Why? Is it an absence of skill? A lack of coordination or resources? A failure of imagination (as the 9/11 Commission famously reported after the events of 2001)? Those that know me might argue that I am guilty of all of them in some measure. Yet I have watched comrades and colleagues from across the Military, Diplomatic, Civilian, and Intelligence domains, from many different countries, have the same difficulties. I believe that we do not yet fully comprehend that which we are contesting. And, in the case of the Islamic State (or al-­Dawlah al-Islamīyah fī al-­ʻIrāq wa-­al-Shām; which creates the Arabic Acronym-­ DA’ISH), we have a Violent Extremist foe that I believe is unlike any other we have contested. 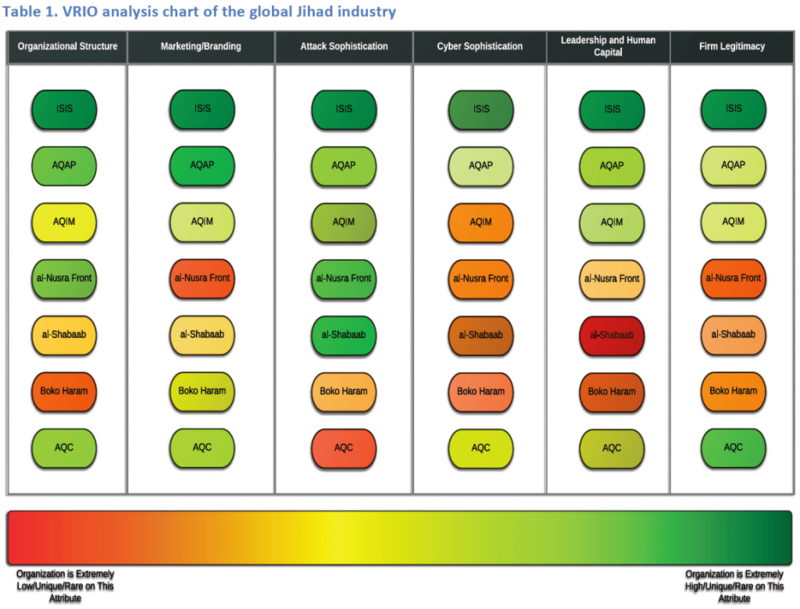 Whatever strengths al-­Qaeda has been able to demonstrate, in all its various forms from North Africa to Pakistan, in its contest with the International Community, DA’ISH is the most effective, most inspirational, and most powerful manifestation of Violent Extremism we have ever seen. And, among all its various strengths, the one that has increasingly demanded attention has been the “intangible” power of DA’ISH—its ability to persuade, its ability to inspire, its ability to attract young men and women from across the globe, and its ability to create an image of unstoppable power and spiritual passion and commitment. While we can and certainly are mustering physical, financial, and other forms of “tangible” power and resources to effectively contest what DA’ISH is and what it strives for, where I would argue we are demonstrating significant weakness and vulnerability is in adequately confronting the “intangible” power of this enemy. The contents of this paper reflect some of the work that Dr. Cabayan and his colleagues are doing to help us understand and comprehend this “intangible power” across a unique enterprise of academicians, scientists, policy intellectuals, current and former Foreign Service, military, and intelligence professionals. Most importantly, their efforts to improve our comprehension will enable us to adjust our efforts, our operations, our investments, and our risk-­‐calculations to more effectively contest it and the organization that wields it. I am grateful for their tireless work in this regard, and I commend it to the reader. We face a terrible foe, and one that the world must defeat. To do so, we must be mindful of the need to understand him. And in the case of DA’ISH, we must come to understand the intangible power that he wields. Only then, can we truly begin unraveling the 21st Century Gordian Knot he has created against us.